We were “dog tired” today. Neither of us had much power behind the pedals. The Altura loop is one of our more demanding loops with many long climbs. The route takes us down through Elba with little exertion but from there it becomes a grueling task. We did make a rest stop in Altura after climbing for 2 miles and were hoping to find something open in town to offer a treat but the town businesses all close at noon and it was already 12:30. One store owner saw us resting as she was closing shop and ask if we needed anything. I shared my hope that an afternoon treat would be nice. She opened back up to sell us 2 ice cream drumsticks. We thanked her for her kind offer. Now we just needed to get to Brewskies where we knew a good lunch could be had. We reached Utica at 1:30 and enjoyed lunch while others enjoyed the Vikings football game. 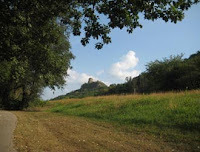 We now had the energy we needed to tackle one more hill before reaching home. It’s always satisfying to reach home after such a trip. When you started out, your mind and body are saying, “no way” but you keep on going, fighting your thoughts until the end when you celebrate this small victory of endurance. 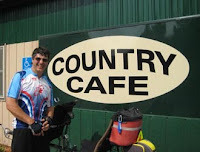 We took a lunch ride to Eyota to eat at the Country Café. We were extra hungry as we neared Eyota and were looking for a good meal—that is not what we got! We both ended up with gastric issues shortly following our lunch. This is something you never want to experience when out on the bike and you’re 15 miles from home. We biked in 3 different temperature zones today—it was in the 80’s when we started our ride, it then climbed into the 90’s at our lunch break and then dropped to the 70’s as we arrived home, bazaar but still a beautiful day to be out riding. 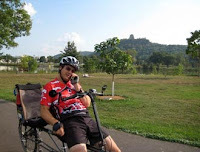 It’s been on my list to bike around the Winona lakes so we packed the bike in the van and drove to Winona for a short visit with Mom and Dad and then headed down Franklin Street to pick up the Lake Park Trail. 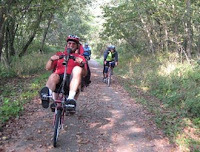 Many people use the trail for various activities which made it difficult to maneuver our bike which explains the low average speed. The view around the lakes was very nice but the geese and seagulls do present a problem. Well, guess I got that out of my system and will remain on the roads for better visibility and safety when biking in Winona. We noticed how short the days are becoming as we were heading back from Breweskies. We have very little time for dawdling. Our new rear rim is coasting well but we still have an annoying squeak emitting from our back end. We’ll have to check my bike seat and see if the cause might be there. The winds were slight and the temps were in the 70’s making for a great evening ride. The last day of T.I.R.E. was planned to be a ride with Ron McKernan. 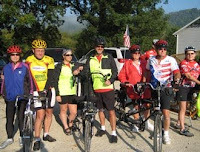 All riders set out through town at 9:30 a.m. towards North River Road with Ron in the lead. 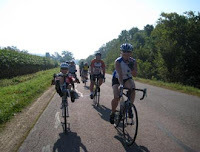 The route was great, probably one of my best in the County—rolling hills, some climbs but great descents. The weather again today was outstanding! The group stayed together to witness the awesome descent of Witt Hill. 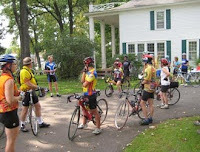 The gathering outside Oak Park Inn following the ride was very uplifting as riders thanked Dennis and I for the wonderful routes. 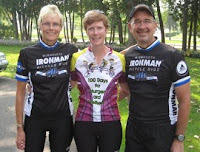 It was tough to say good-bye knowing our week of riding was ending—this biking vacation (MTR, Post MTR and T.I.R.E.) topped our list of best trips taken (including London)! 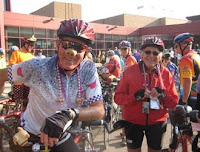 Greeting us in the mail when we arrived home was a beautiful card from Joan and John Laabs thanking us for our part in planning the Post MTR ride in Lanesboro. 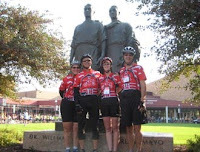 We have met so many wonderful people along our biking travels and they have all played a part in making our lives more enjoyable. 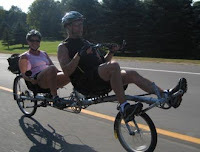 Today Dennis and I were back on the tandem. 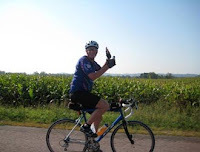 It was to be another beautiful riding day in Trempealeau County. The medium route took us up to Hansen’s Hold-Up for lunch and down Alligator Slide and then into Arcadia where we biked past the Memorial Park. 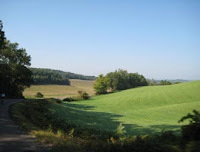 Our next big hill was approaching so we began to pick up speed and gear for the climb over Church Hill. As we began to gear down, Dennis got stung on the lip by a bee but, being the great captain he is, he kept it all under control and we continued the climb. LeAnn teased that he had Angelina Jolee lips. We were back in Whitehall in time to wash up for the evening banquet. The ride went well today except for one wrong turn on the medium cue sheet. I had a bit of apologizing to do to a few riders that put on some extra miles because of the error but all were very good sports about the mistake. 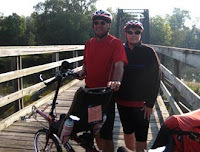 Wow, another major accomplishment for Deb—Biking Trempealeau County on the Bacchetta! 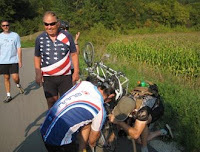 As we were packing the tandem for its trip to Whitehall to participate in the Trempealeau Invitational Ride Event, we noticed a crack in the rear rim. We called Kevin immediately at the Blue Herron in Onalaska to see what he could do and he came through for us again. It did mean I would have to ride my single for day #1 of the T.I.R.E. ride but I was ready for the challenge. 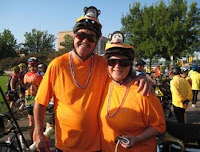 Barb Garthus rode the short route with me providing much encouragement. 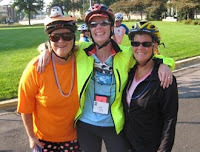 I had a great time and was glad I had this chance to increase my biking confidence. Dennis stayed at the Inn waiting for Kevin to call with news of the tandem rim so that we could ride the rest of the weekend together. 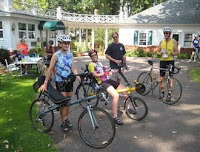 The Post Ride ends today with Dennis and I biking to Rushford with Kathi and John Johnson. 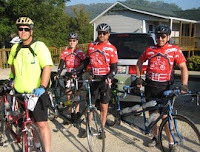 They buy our breakfast at Stumpy’s and then continue to bike to Huston where Solomon’s drove their car. 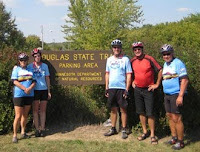 They were able to bike the complete trail during their Post Ride tour. We will be seeing the Johnsons again in October for the COWS Fall Rally so it was easier to say good-bye. 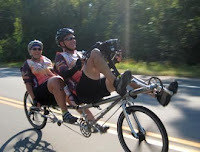 After sending all our ride buddies home, Dennis and I also head for home with many great memories of time spent with our tandem friends. The weather was the best I’ve seen in a while making for a very successful COWS Post MTR Ride along the Root. We’re up early this morning to make breakfast for the 14 teams prior to riding today. Dennis made Belgian waffles for the crew and we then readied ourselves for a 9:00 a.m. mass start towards Harmony. 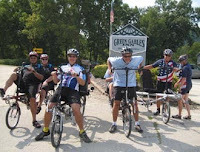 A rest in Preston allows us to visit with the members of the other Post Ride taking place in Lanesboro. I have never seen so many tandems riding the Root at the same time. Following our short rest, we begin our climb towards Harmony where lunch awaits us at the Village Square. They did well serving all 24 of us wanting to be fed at the same time. The food was great and the pie even better. We’re fed and now feel we can take on the highest mountain and a few of us decide to continue to climb up to Fountain. Once at the top, we collapse on the park property before finding an ice cream treat in town. The glide back down was reward for our hard work. Supper was planned at the Old Barn Resort at 5:00 p.m. but we approached the Resort about 3:30 p.m.—a little too early for supper but a few drinks would do just fine. Our dinner guests began arriving to join us around 5:00. The Resort served 26 of us and did an excellent job. 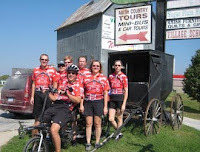 We left the Barn around 7:00 p.m. to bike the few miles back to Lanesboro, reaching town before dark. We gathered in the Green Gables court yard again for a social hour to chat and share pictures. 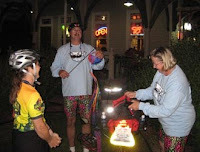 We said our good-byes to those not riding the next day and turned the lights out around 10:00 p.m.
Dennis and I decided not to bike the MTR breakfast ride but instead to get ready to host a burger lunch on the farm for all Post Rally attendees. 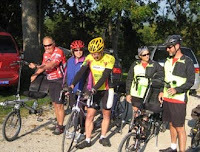 We fed 6 of the 14 teams attending the extended ride in Lanesboro. Following lunch, we all caravanned down to Lanesboro where most checked into the Green Gables Inn, our host hotel for the next two days. 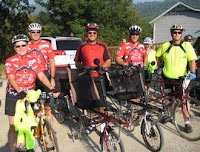 We got in a short ride to the Old Barn Resort before we had to be back at the Inn to set up for the social hour beginning at 7:00 p.m. Again the weather cooperated for outdoor fun and it looks to continue on into the week. 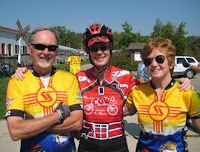 Another 9:00 a.m. mass start but Jim and Shirley joined us in the crowd. 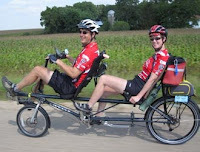 It was fun to witness them enjoying their first Midwest Tandem Rally. We chose the medium route again today which took us towards Byron and into Mantorville for an early lunch—a repeat of yesterday’s lunch. We visited here for quite some time before moving on towards Pine Island. We were joined by Kathi & John Johnson and Joan & John Laabs for an ice cream treat at the A & W in town before trekking towards the Douglas trail for our route back to Rochester. 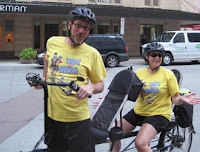 We then packed the bike in the van and drove to MCT to clean up for the evening banquet beginning at 5:00 p.m. We arrived back downtown with some time to organize a pre-social hour with our friends outside Chester’s. The MTR banquet was fun and the food was good. 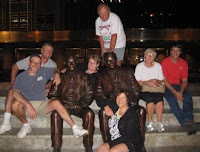 We sat with our PIGS friends from Iowa knowing we would not get a chance to visit with them again until next year. It was during the banquet entertainment that Faith was given the opportunity to announced Dennis’ Friday blunder, which received a roar from the audience. 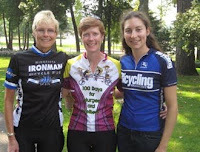 We visited some following the banquet and then headed back to St. Charles to set up another campfire for our weekend campers and prepare for the COWS Post MTR Ride in Lanesboro, MN. I sure do enjoy a mass start! 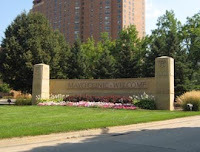 The staging area was held at the Mayo Civic Center Circle Drive. All the bikes lined up and prepared for the 9:00 a.m. start. We were escorted out of town by the Rochester police—inexperience showed but we did all make it out of town with no injuries. 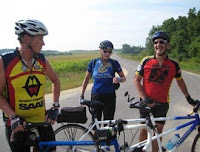 The medium route sent us out on CR 1 towards Simpson, through Racine and High Forest, stopping at Bear Cave Park outside of Stewartville for lunch—a cold sandwich and not much else to speak of. 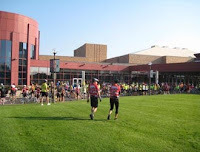 We then continued on CR 8 into Rochester where we picked up the city trail again to return back to the Peace Plaza. 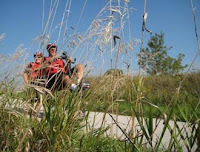 This was our second great-weather day—in the 70’s with no wind and plenty of sunshine, a biker’s paradise! 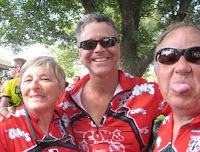 We intended to return to Rochester early so that we had time to visit the vendor area and as we were nosing around, Jim and Shirley Hamm found us and we chatted some and invited them to join us in the COWS' hospitality room starting at 5:00 p.m. We made introductions and before the evening ended, they decided to join the COWS tandem club. What an exciting moment for them. We did not have supper yet so made plans with Joan & John, Marilyn & Gary and Kathi & John to walk to the Canadian Honker, an excellent choice. Following dinner, we parted to return home to St. Charles with Lane and Linda. We were all too tired to sit by a campfire so went directly to bed. 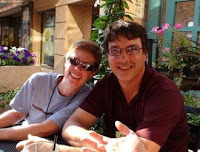 Thanks Lane and Linda for the gift—a photo of Dennis and I taken by the rally's pro photographer, Miles. 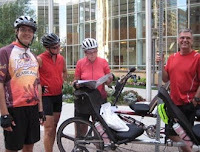 Following our morning ride around our neighborhood, we lead our Wisconsin friends to MTR Rochester and unloaded bikes at the Peace Plaza downtown. 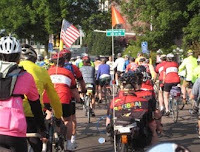 After finding parking places for all vehicles, we met up with riders to bike the Friday ice cream ride through Rochester via mostly bike paths. 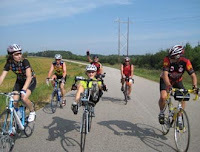 Half way through our ride, Dennis was surprised to be informed that his stoker was not on the back of the bike! 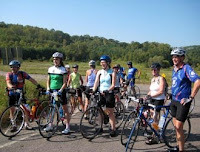 I was left behind while all bikes began descending a steep hill along one of the bike paths. This was the joke of the event and was even announced during the Sunday banquet (good one, Faith). 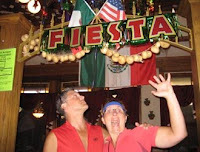 Following the planned ride, we biked to Dos Amigos with 16 other riders. It was dark when we began our short ride back to the host hotel. The streets of Rochester were well-lit allowing us to get back safely. 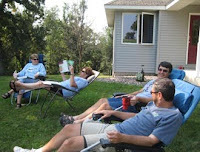 We then drove home to St. Charles with Lane and Linda—they were camping in our yard for the weekend. A campfire in our yard ended this excellent beginning to the 4-day rally.